This year’s CES 2019 technology extravaganza provides an opportunity for the world to see the latest innovations in technology in front of an anticipated audience of more than 180,000 attendees from more than 150 countries. Robotics and machine intelligence were key topics discussed at the conference, as automation technology is expected to create 58 million net new jobs by 2022. Not only can robots handle jobs that are less desired by human workers, but introducing them into the retail environment allows workers to focus on more complex, customer-facing tasks. 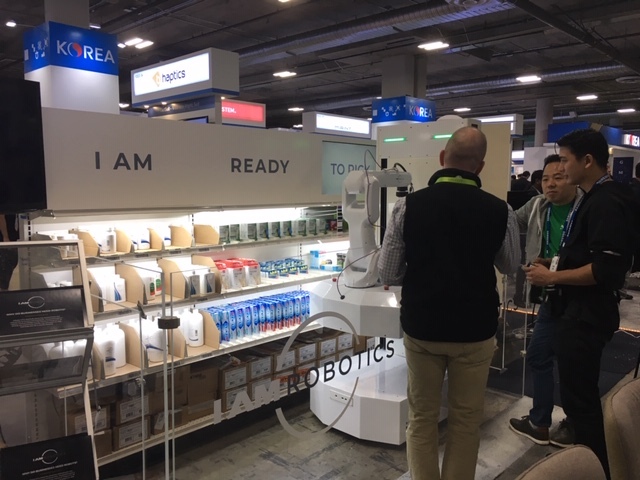 Our IAM Robotics team traveled to Las Vegas with the world’s first mobile piece-picking robot, Elvis, to reveal how robotics is changing the shopping environment. At CES, we had the opportunity be part of the Plug and Play booth as one of the many exciting startups that Plug and Play, a global innovation platform, has supported. Elvis had room to show off his skills by picking items from shelves that attendees selected. 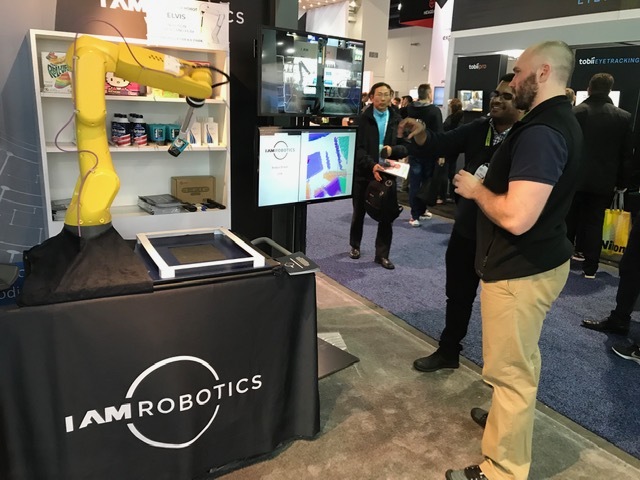 In addition, our partners at Orbbec demonstrated the 3-D vision that they worked on with us to create how the robotic arm of Elvis identifies products. The growing popularity of e-commerce means that consumers will be expecting more same-day pickup and delivery services by retailers. Grocery stores will also be expected to keep up with consumer demand; online grocery shopping is predicted to grow to 20 percent of total grocery retail sales, totaling an astounding $100 billion. Having an autonomous robot take care of the monotonous job of picking items allows workers to be more productive with their time, creating opportunities for stores to improve their business in other ways. Interested in discussing how robots can help businesses prepare for increasing demands for faster delivery? The IAM Robotics solution helps retailers elevate their offerings to create a new shopping experience.